The rise of capsule espresso machines has significantly reduced the hassles of brewing coffee. Designers are continually evolving them into more convenient devices making the task of making great espresso much easier. 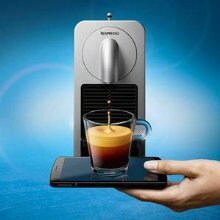 And so came the Prodigio, the first Nespresso maker that you can control over your phone. The Nespresso Prodigio has an inbuilt app which you can use to control the machine from a smartphone. The app allows you to prepare coffee as you progress with other chores, or when resting in bed or your couch. You can instruct the Prodigio to brew in real time or at a future point by utilizing the timer. It alerts you when you are running out of coffee so that you can have the espresso maker brewing some more. It also informs you when the water level in the reservoir is getting low, when the capsule container is full or when the machine needs descaling. Physically, the Nespresso C75 Prodigio is similar to some other Nespresso machines, but the Prodigio differs tremendously in design. Unlike most espresso machines with small fixed water reservoirs, its cylindrical water tank has a generous capacity of 27 oz. It sits on a base which rotates through 180 degrees. Moving the tank to the side or the back helps the machine to adapt well to limited spaces. The base also has a compartment for storage of the power cord. Its flexibility allows for convenient access to the wall power supply without the need for moving the whole machine. The Prodigio has removable capsule container allowing for easy insertion and ejection of capsules. It uses the Nespresso Original Line Capsules only. The hermetically sealed aluminum capsules preserve freshness for exceptionally tasting espresso. The capsule container stores up to 19 used capsules which are recyclable. This high-performance espresso machine is very energy efficient. It saves power by switching itself off after nine minutes of idle time. Its high-pressure pump produces an amazing 19 bar pressure which extracts the flavor of each coffee capsule exhaustively resulting in a thick cream with a beautiful aroma. It heats up in a record 25 seconds. The Nespresso Prodigio features a foldable drip tray for the accommodation of different mug and glass sizes. At the top platform of the gadget, there are a few manually operated controls. There are three buttons for selecting three cup sizes; the Lungo, Espresso, and Ristretto. Then there is a slider for opening and closing the capsule installation cover. Finally, a light indicator shows when the tank is low on water, when to remove used capsules, and when the machine needs descaling. To turn off the Prodigio manually, you will need to press and hold the Lungo and Espresso buttons simultaneously for 3 seconds. You can program the default 9 minutes energy saving mode to last to about 30 minutes. You can as well adjust the amount of water you would like dispensed for each cup size to more or less. Another advantage with the gadget is that you can changeover from a cup size to another while still dispensing. This feature is handy when you happen to press the wrong button erroneously. 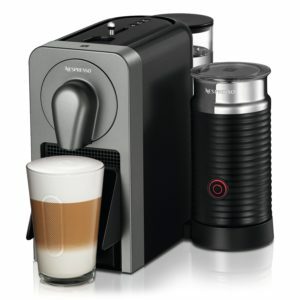 You can use the Nespresso Prodigio alongside an integrated Aeroccino milk frother. Steaming the milk within the same setup and having a remotely controlled app makes the preparation of ready-to-drink coffee incredibly convenient. To fully utilize the features of the Prodigio, the first step is to pair it with your Bluetooth device. Its app requires you to create an account in a straightforward procedure, allowing you order new capsules when needed. On completing the steps, you are ready to make your first cup. You set the water levels manually using the buttons at the top of the machine. Then you have the option of brewing your coffee automatically right from the app. The machine takes approximately 25 seconds to heat up to the optimal brewing temperature. Brewing starts by inserting a capsule, replacing the cover and fastening it with the slider. 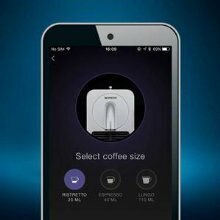 Next is to select the Brew Now button on your smartphone, then choosing the desired cup size and placing the appropriate one under the spout. The cup platform flips over to accommodate the right cup upon selection. When done with brewing, the machine automatically releases the used capsule into an inbuilt container. Apart from convenience, there is no functional difference between using the manual, the app, and the scheduled brewing process. The app is a valuable feature during troubleshooting. It provides clear video tutorials for all processes from startup to descaling instead of perusing hardcopy manuals. The Prodigio assures you smooth coffee with rich flavor and silky crema. Nespresso offers around 21 capsules with various editions such as great roasts and assorted flavors like chocolate and caramel. There are also decaffeinated capsules. Fans of milk have an option to order an Aeroccinno frothing package alongside the Prodigio. How to clean Prodigio machine? The Nespresso Prodigio C75 delivers great coffee an optimal brewing conditions. You can program it to prepare you a cup at your most convenient time. It has fantastic features which you can hardly find in other espresso machines within the same price bracket. Being neat and compact, it can fit in almost all settings, including your office. The Nespresso Prodigio is a must-buy for coffee beverage fanatics.